What is the true extent of haoshoku no haki? How do you figure a one armed man can stop a war? The strongest haoshkou no haki in the world.... maybe? Re: What is the true extent of haoshoku no haki? 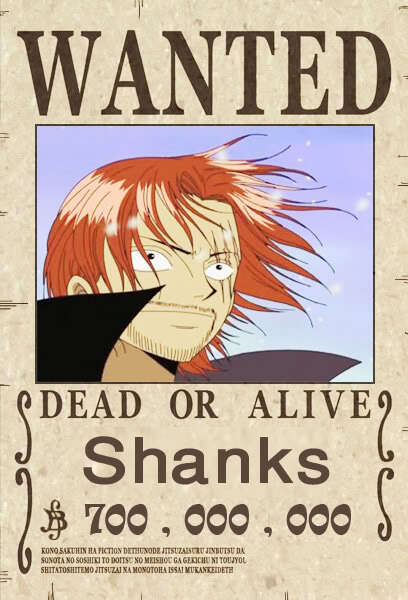 Yeah, Shanks is truly epic. I really loved that theory, and I somewhat agree with it! (you posted that once in the progress thread if I remember correctly) The king's haki has really been useless against stronger opponents, and from everyone's expression in the War of the best when Luffy used it, I can say it surely means much more than simply knocking the weak people down. Controlling all forms of matter and energy might be somewhat overpowered though. I am also sure that Zoro owns the king's haki as well; since he is one of the most willing and ambitious mates on the strawhats. Yup, I posted it before haha. Everything you believe is exactly what I think too, the Zoro part as well. I think Shanks' power is similar to Roger's. He watched his captain rule the world with haoshoku and he's stepping up to do the same. Controlling does sound a bit farfetched I say, but since it can damage physical objects I think that it may be able to suppress or negate attacks, kinda like pain manipulating stuff. When Luffy ko'ed the 50,000 guys at fishmen island, remember Zoro said "If he couldn't do that much then he'd have to step down"? I think Zoro has it... idk. If not then he might get it, since a lot of guys are stated to have it when further in the NW.